You may recall my excitement earlier this year when Alpha Omicron Pi was one of the sororities that won Lilly Pulitzer's contest to be part of the Sorority Collection (see post Alpha Love). Thanks to Lifeguard Press, I have a few little reminders of my sorority days in Lilly form. I'll be honest, I didn't like the AOII print at first but it has grown on me. I wouldn't wear the scarf or bag (available on Lilly Pulitzer), but I will outfit my phone. Is your house part of the collection? Do you like your print? I love how you wrote "house." SO Lehigh. Not loving the print :( My friends are in other houses and have gorgeous prints, it's such a bummer. 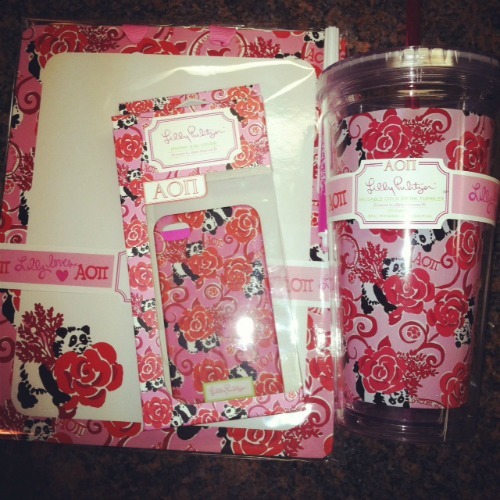 I am definitely planning on getting the ADPi tumbler! I was an AOPI too! :) The coffee mug is perfect for early mornings on the go!